PNNL: Stressed Out: Can Models Predict Grid Tolerance to Environmental Extremes? A regression model performs well in predicting grid stress based on regional weather conditions. Researchers explored how well statistical models could predict electric grid stress based on weather conditions in a particular region. Understanding the environmental conditions associated with stress on the electric grid has important practical considerations, but also represents a complex scientific and modeling challenge. A research team led by scientists at Pacific Northwest National Laboratory explored how well statistical models could predict grid stress based on weather conditions in a particular region. Scientists found one type of statistical model provided predictive value and was easy to interpret. The electricity sector develops contingency plans so that the grid is reliable even during periods when it is stressed by extreme weather events such as heat waves. Industry planning and operations teams could use the novel statistical techniques developed through this research to better understand and predict grid stress in the context of evolving electricity infrastructure configurations and environmental conditions. The results also provide insight into the development of next-generation modeling and analysis tools to represent interactions between energy and Earth systems. Researchers constructed statistical models based on the weather variables that tend to give rise to grid stress. 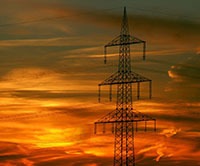 They used 10 years of high time-resolution electricity load and pricing data from 16 zones in the PJM (Pennsylvania-New Jersey-Maryland) Interconnection (a regional transmission organization), along with observed weather data from the same time period. After testing several model types, researchers found that a penalized logistic regression model performed well in predicting grid stress when fit to a specific operational zone. It also revealed the weather variables most important for predicting grid stress in each zone. In addition to daily maximum temperature—typically the only variable that the electric power industry considers when making load forecasts—researchers found that other predictors of grid stress included humidity, precipitation, and lagged variables that account for persistent stresses on the grid over multiple days. In some zones, model performance was improved by including weather information from other zones, which may reflect the grid's interconnected nature. Assuming that data are available, the methods presented in this work could be extended to other regions or used to project potential changes in grid stress associated with future climate and infrastructure scenarios. The U.S. Department of Energy Office of Science, Biological and Environmental Research supported this research as part of the Integrated Assessment Research program through the Integrated Multi-sector, Multi-scale Modeling (IM3) Scientific Focus Area.